There are many who await that next delightful Royal Spyness Mystery, and now that it has arrived, no one will be disappointed. This is not only a new book in the series, mind you, but it is a huge step for the lead, Lady Georgiana Rannoch, better known to us all as Georgie. Georgie’s life is a bit chaotic lately. After all, the days are counting down to that huge event, her wedding day. She is not only going to become the wife of handsome, Darcy O’Mara, but Georgie also has to plan a wedding that has become huge. The queen is coming. Readers will remember that Georgie withdrew her name from the royal line of succession and thought she would have a very simple ceremony when it came to say, “I do.” But now she’s looking at walking down the aisle before queen and country, and she still has to find a house for her and her husband to move into. With Darcy away, Georgie’s mother and granddad are there to help, but it’s soon seen that house hunting is not for her. The gods intervene (well…godfather, anyway) and he gifts Georgie and Darcy his completely staffed estate. Not only will Georgie be a wife now, but she will also be the Mistress of Eynsleigh. Turns out, the staff is made up of people who seem to know little about their jobs, the grounds are a complete mess and are certainly not something the queen should see, and a strange gas leak in her bedroom causes Georgie and others to believe that someone is trying to take the mistress out before she sets up house. 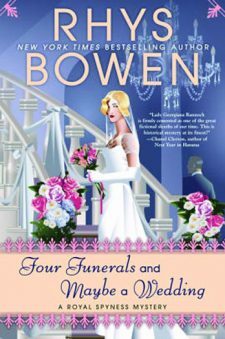 The characters are charming, the mystery is captivating, and the memorable book titles just keep on coming from Bowen. Georgie is still one of the best of the best in fiction and, hopefully, she will continue for years to come. 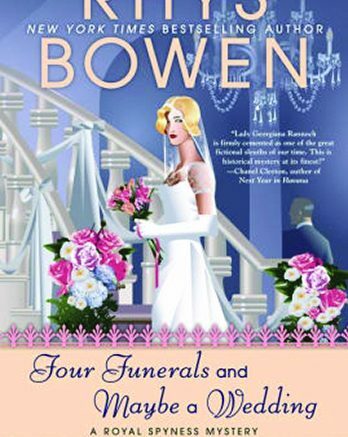 Be the first to comment on "“Four Funerals and Maybe a Wedding” by Rhys Bowen"